Increase opportunities for nature-based education in any early childhood program, regardless of climate, region, budget, or experience. Nature-Based Learning for Young Children is designed to provide ideas for all early childhood educators ranging from novice to highly experienced in a wide range of ecosystems, including forests, cities, prairies, coastal, urban, and deserts. 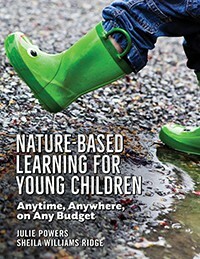 It includes background information on a range of nature topics, reproducible parent newsletters, sample play-based lesson plans, guidance and health and safety issues related to nature activities, ideas for free/inexpensive equipment and materials and for big-ticket items, ideas for family involvement, and connections to early childhood learning standards. Chapters are divided by nature topic, so readers can dip in right away where they want to start exploring.